Town manager says island, other coastal communities ‘carved out’ of state legislation. 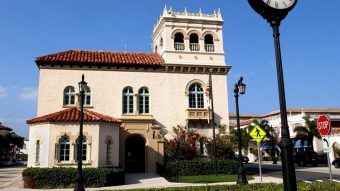 Town Manager Tom Bradford said Tuesday that Palm Beach and some other coastal communities have been exempted from legislation that would limit local control on the installation of 5G transmission equipment. The legislation has passed the House and Senate and is awaiting Gov. Rick Scott’s signature, Bradford said at a meeting of the Underground Utilities Task Force. The exemption or “carve out” is welcome news in Palm Beach, where Bradford and Mayor Gail Coniglio have warned the new law would be an aesthetic disaster. The legislation severely limits state and local government control over of public rights-of-way where 5G, or fifth generation wireless technology, is being installed. The legislation’s sponsors, Sen. Travis Hutson, R-Palm Coast, and Rep. Mike La Rosa, R-St. Cloud, say it will promote the use of much faster digital service throughout Florida. “We in essence could have every public right of way marred by a utility we have no control over,” Coniglio has said. Coniglio traveled to Tallahassee last month to lobby for the exemption and against a flurry of bills that attack home rule – the ability of counties and municipalities to exert local control. Bradford said the exemption means the town will have much more control in regulating where the 5G equipment — “small cells” that are the size of a suitcase or small refrigerator — will be located. Coniglio could not be reached for comment Tuesday. Last month, Town Council declared a moratorium on applications to place wireless communications on public property and in public rights of way. Had the town not been exempted, the moratorium would not have protected the town against the state law after it takes effect July 1, Town Attorney John Randolph has said. The ban temporarily blocks all applications to place wireless facilities on public property, in the public rights of way or in public utility easements while the town crafts new regulations.